This post has been sponsored by The J.M. Smucker Company. All thoughts and opinions are my own. Thank you for supporting the sponsors who support A Simple Pantry! Love is in the air, my friends, and if there is one thing that shows how much you love someone, it’s a homemade treat! 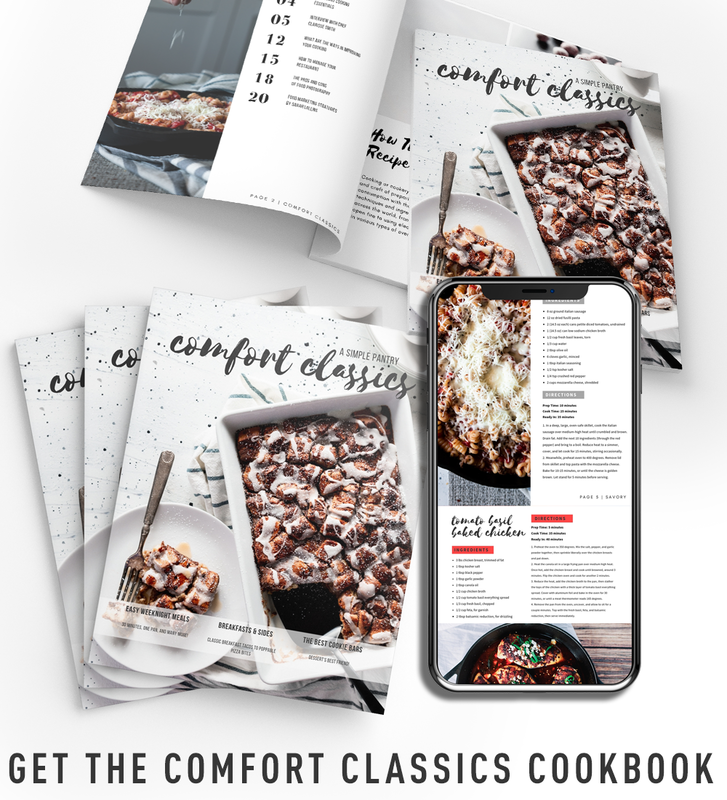 Of course, we all want to make something fancy, so you came to the right place, because I’ve got you covered for fancy, while still giving you easy recipes for dessert. It’s a total win-win, right? I decided that hitting up my fave store was a must, so I ran over to Target and grabbed myself a box of Pillsbury™ Chocolate Fudge Brownie Mix, and a Pillsbury™ Filled Pastry Bag. But, we were just getting started! I’m not making just any ol’ dessert. 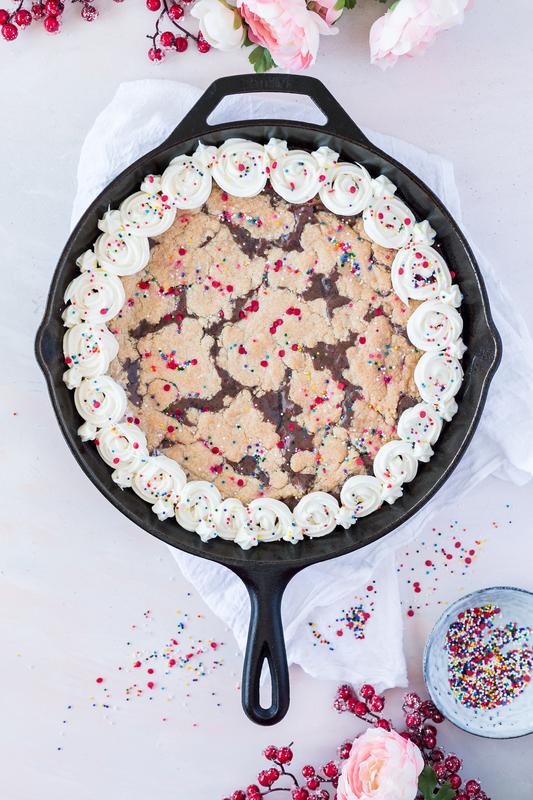 We’re going big here with a super amazing funfetti cake batter skillet brookie! It’s OK, I’ll give you a moment to wipe up all that drool. I have the same problem all too frequently myself. There should be a support group for this. Too Delicious Anonymous. I can’t handle myself! But, back to business, so, I needed to grab some Crisco® Vegetable Oil, and everything to make my signature cake batter cookie bars. Go big, or go home. But don’t make it hard. 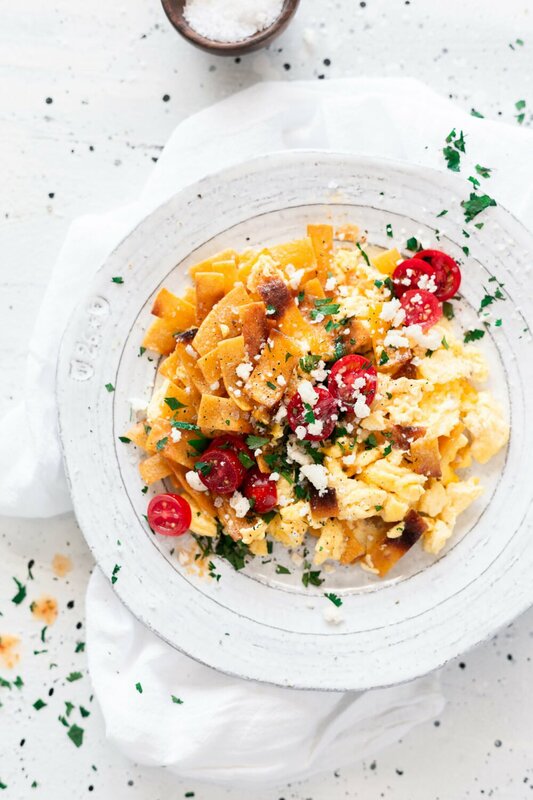 All you really need is two bowls and a big cast iron skillet. Like 12 inches. Cause, go big or go home. I really love going the halfway homemade route, because there is so much you can do with a simple box of brownies. I went with the Chocolate Fudge, because you know me, I love me some rich chocolate flavor. After that, I whipped up the cake batter cookie bar dough, which makes a good amount. I split it in half, using one portion for the skillet brookie, and saving the rest to make into cookies another day. 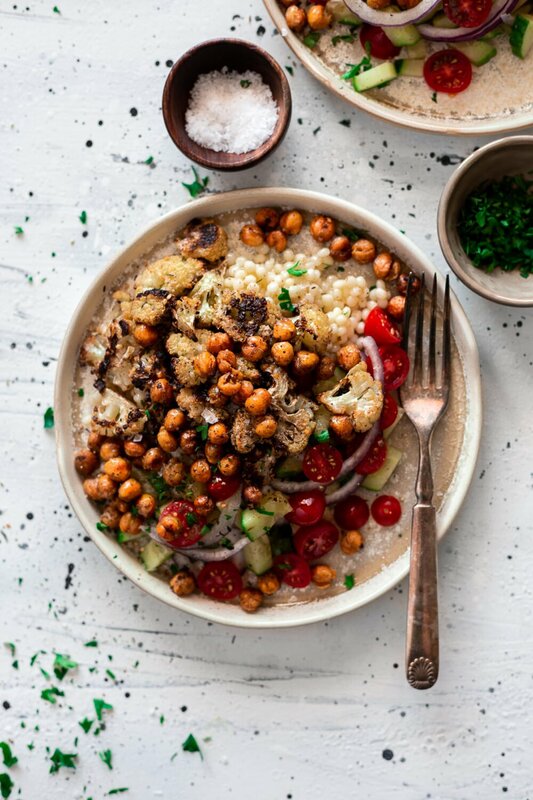 Easy recipes that yield a second serving for another day?! Is there such a thing as a win-win-win?! Because that is what this dessert feels like. Putting the skillet brookie together is pretty fun as well. I always start by adding the brownie batter in a nice, even layer. Then I grab some of the cookie dough and kind of flatten it out with my fingers into thick disks and just start plopping them in the pan. I made mine quite random, but if you have the ambition, I bet you could create a really cool design with the cookie dough in the brownie mix. 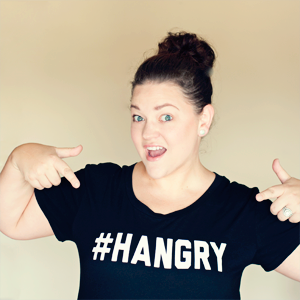 Oh man, if you do that, please please please post it on Instagram and tag me with #asimplepantry. I want to see that genius. I don’t know why I didn’t think to make a heart. I’m ridiculously sappy like that. Be my, be my baby. 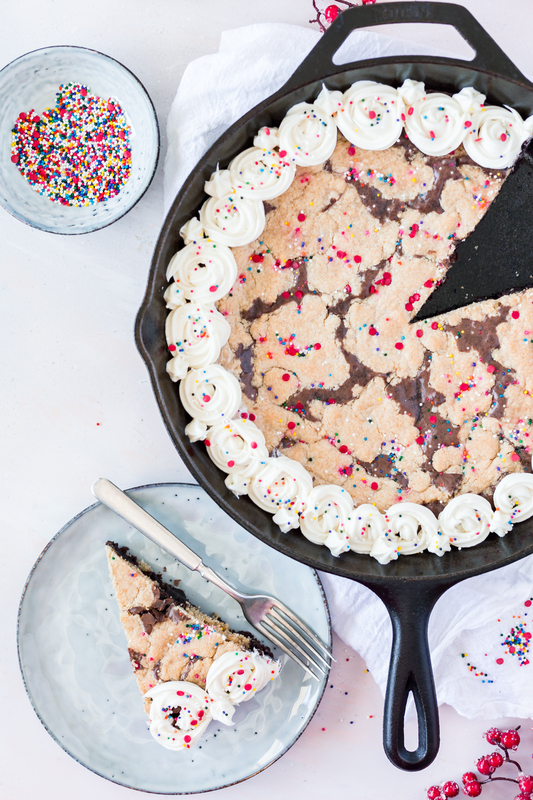 Once you get all that cookie dough plopped in the brownie batter, pop that bad boy skillet in the oven and just try not to lose your cool smelling those noms bake for the next half hour. 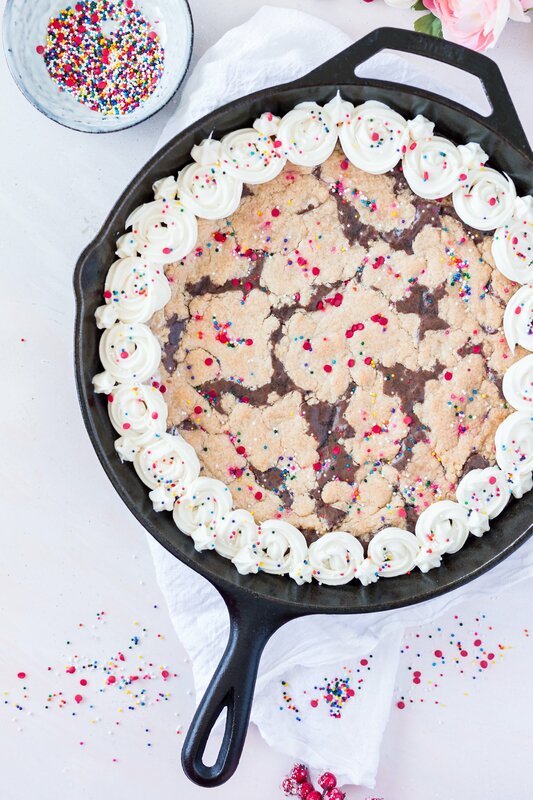 As much as I love to dive into a hot, fresh dessert, we gotta let this skillet brookie cool down a bit, so we can top it with some divine vanilla frosting with our Pillsbury™ Filled Pastry Bag. It even comes with its own star tip! You can make fun little rosettes like I did, or fill it with a ton of little flourishes…anything you want! I went with a simple rosette ring around the pan, and then topped the whole thing with some extra sprinkles for a funfetti finish. 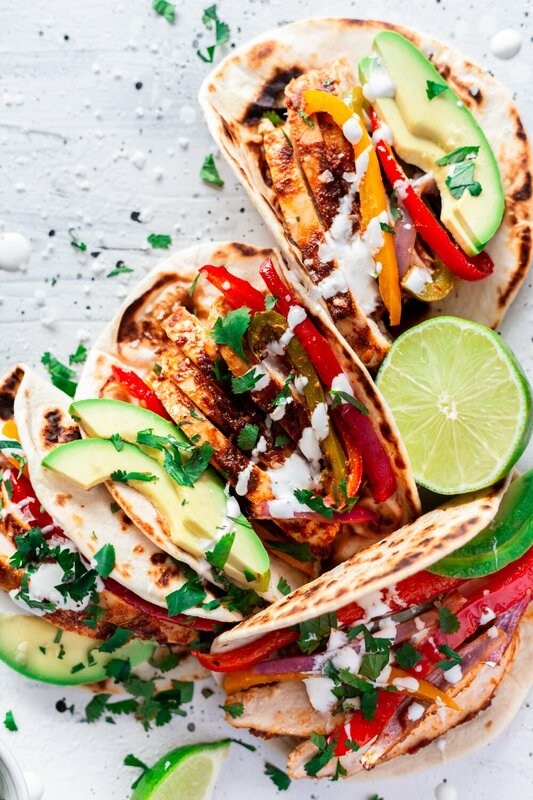 This easy recipe is sure to please. Especially since you made it with love. 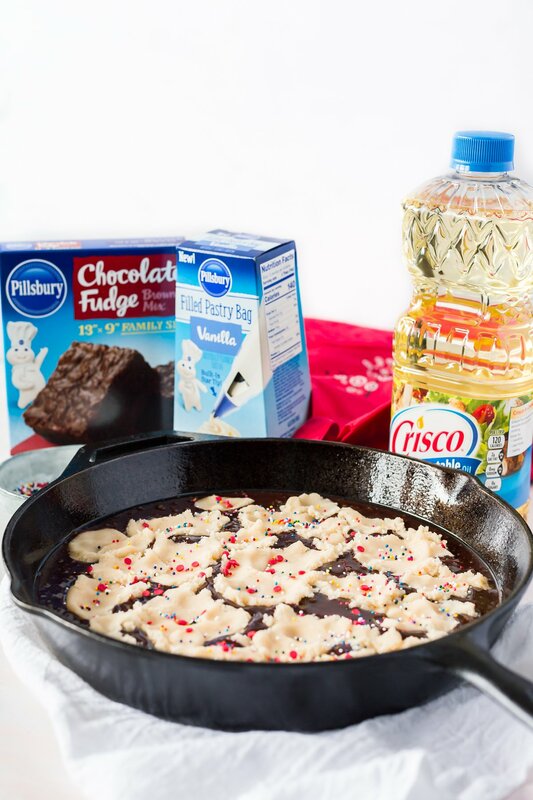 Be ready for your Valentine’s Day by hitting up your local Target, where you can get 10 for $10 on Pillsbury™ Brownie Mix between 2/4/18 and 2/17/18! Talk about a sweet deal! Now let’s get to baking some easy recipes! Yay! Preheat oven to 325 degrees. Grease a 12 inch cast iron skillet and set aside. 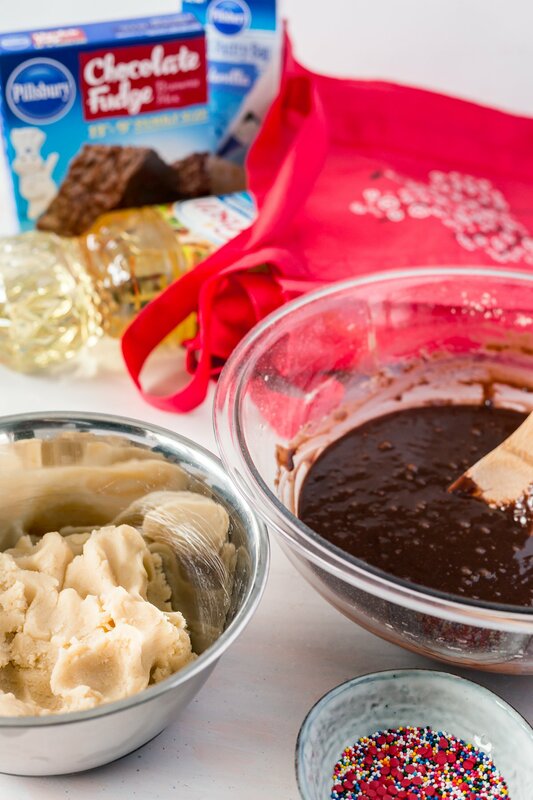 In a large bowl combine the brownie mix, vegetable oil, and eggs. Stir until well-blended, around 50 strokes. Pour into bottom of cast iron skillet. In the bowl of a stand or handheld mixer, add the butter and sugars, then beat with a paddle attachment on medium until smooth and slightly fluffy, around 3 minutes. Add the egg and beat on high for 1 minute, then add the vanilla extract and beat on high until combined. Whisk together the flour, cake mix, and baking soda, then add to the wet ingredients and beat on low until just combined. Do not overmix. Gently stir in the sprinkles, then divide the dough in half, saving one portion in an airtight container in the fridge for another use. Pull chunks of the dough apart and flatten into thick discs, then place them in the skillet with the brownie mix, pressing each piece down into the brownie mix to cover the edges only. Place skillet in the oven and bake for 35-40 minutes, or until the middle is just barely set. The center should remain slightly fudgy, but shouldn’t visibly jiggle when shaken. Remove from oven and let sit until cool. 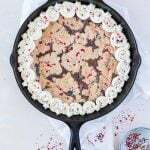 Using the pastry bag, swirl vanilla frosting onto the skillet brookie in any pattern you’d like. 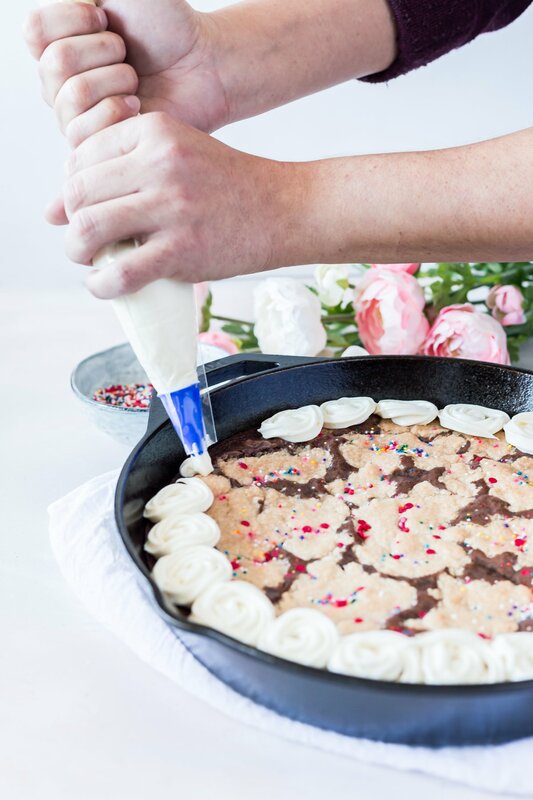 Sprinkle with additional funfetti sprinkles and serve. GIRL! This brookie is MY JAM!! Whenever we order from Dominos, I can't resist ordering their version because it's so convenient - but this looks waaaaaay better! 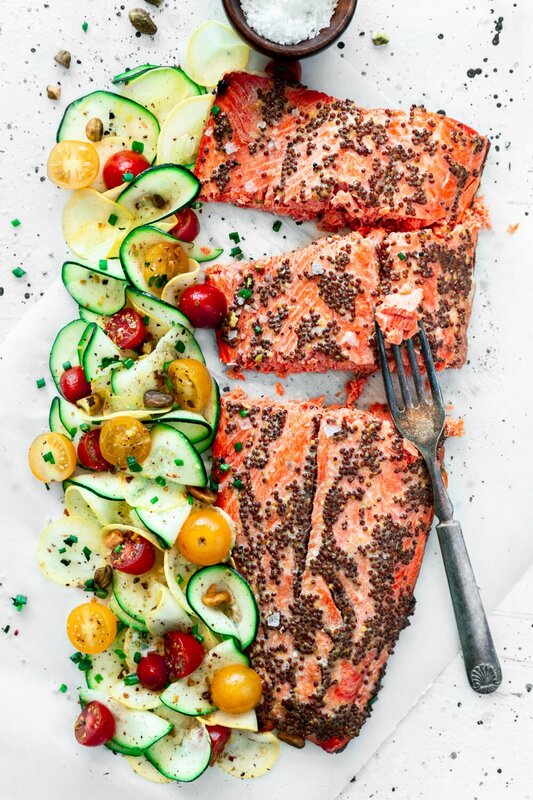 I absolutely love Brookies, they're a total weakness for me and I can't wait to make this recipe! Love how easy it looks too! Be my Valentine? That brookie looks so good! Love this idea! 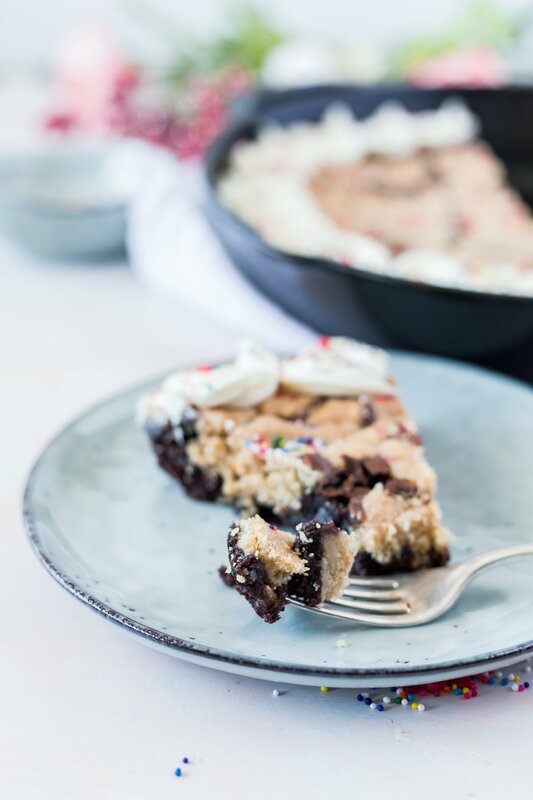 wow the best of both worlds collide in one dessert, this looks amazing I need to try it soon =) perfect treat for Valentine's yummy! 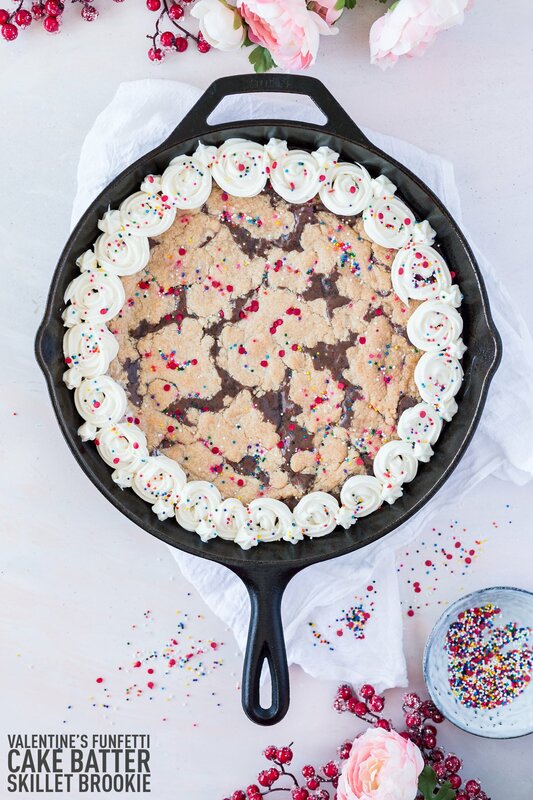 I for sure need this skillet cookie in my life. Or not since I could totally eat the entire skillet! 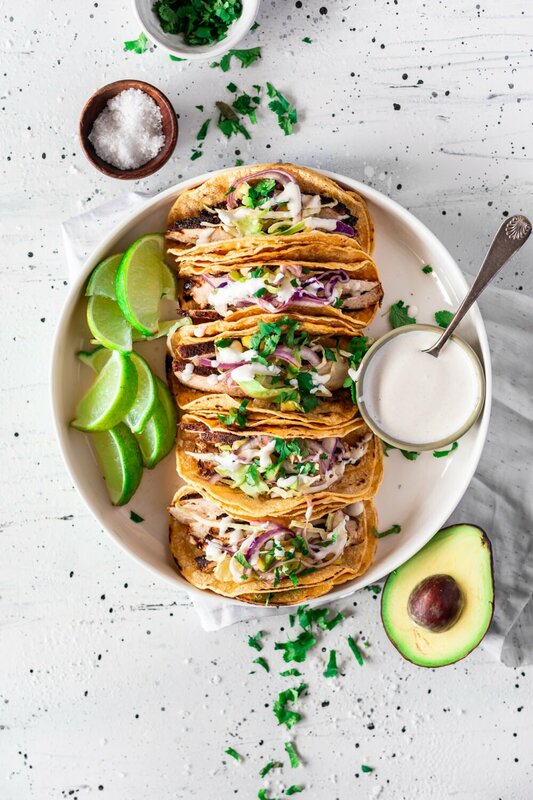 This looks like such a fun and easy recipe! The dish looks so very vibrant, just perfect for the Valentines! I will decorate mine just like yours! Thanks!